If you like to play slots online, the chances are you’ve heard of the game creator Quickspin. Many UK casinos feature games from Quickspin, even though they are in fact a Swedish company. They are responsible for creating many of the best slots online and considered by many to be one of the best gaming companies. This article will give you more information about Quickspin, their games, and their impact on the UK casino market. Quickspin was created by a team of Swedish slot enthusiasts aiming to provide innovative gaming solutions to the gambling market. The company don’t only cater for the UK gambling industry, they also are responsible for creating free to play and social games. In 2017 the company won the Innovation In Mobile award at the EGR B2B awards. In addition to this, the company also scooped awards at the EGR B2B awards in 2014, 2015, and 2016. Quickspin’s creators have had a big impact on the UK gambling industry, with many top UK casinos hosting their slot games. Although Quickspin has only been around since 2012, and may be considered to be fairly new when compared to other top gaming companies, their team is made up of some very experienced individuals. The CEO of Quickspin is Daniel Lindberg, former Director of Sales and Head of Product Management at NetEnt, where he worked for five years. The company’s vice presidents Mats Westerlund and Joachim Timmermans also worked for NetEnt and Unibet in the past. Which UK Casinos Feature Quickspin Games? Quickspin games can be found at casinos such as Casumo, Leo Vegas, Mr Green, Bet Victor, Ladbrokes, and poker rooms such as Pokerstars. Beowulf is a slot game that takes players on an exciting adventure, and it’s filled with bonuses. The game is based around the Scandinavian adventures of Beowulf and is set on a snowy mountain. The reels are packed with different wilds including horns, swords, and the Beowulf wild. The reels include dragons, viking warriors, princesses and other mystical symbols, and the game has a great bonus feature called Grendel attack that awards re-spins with locking wilds. Players are also given the choice to select other bonus games when the bonus symbol appears. The game also features scatter symbols that will award free spins when three appear. a lot of attention. This is probably due to the fact that the characters and the game itself is loosely based around a popular animated film series. The game is very upbeat and features colourful imagery and silly sounds that give players a light-hearted bit of fun. The game is set at a beach party and the symbols are filled with symbols that go along with this including cocktails, and champagne. The reels also contain Spinions wilds that can stretch across all reels and lead to big payouts. Joker Strike is a video slot that was created by Quickspin mainly for high rollers. However, casual players can also enjoy the game as the minimum bet is only 0.10. It is the type of game that is more beneficial to high rollers as a 20 credit spin will award players with a wild symbol every five spins, and a 30 credit spin will award one on the game itself and the special outer wheel that the game features. Furthermore, those that like to bet big will get even greater perks, as a 50 credit spin guarantees further wilds and a higher chance of hitting the jackpot on the outer wheel. The game itself is a simple 5×3 video slot with very colourful and alluring graphics. Are Quickspin A Trustworthy Creator? Although some players may be put off by the short life of Quickspin as a company, their credentials prove them to be trustworthy. Many big UK casinos feature games from Quickspin’s repertoire, and all UK casinos are required by law to have licenses in place to ensure they are operating fairly. In addition to this, Quickspin have won a number of prestigious awards in the online gaming sector, which further justifies their legitimacy. 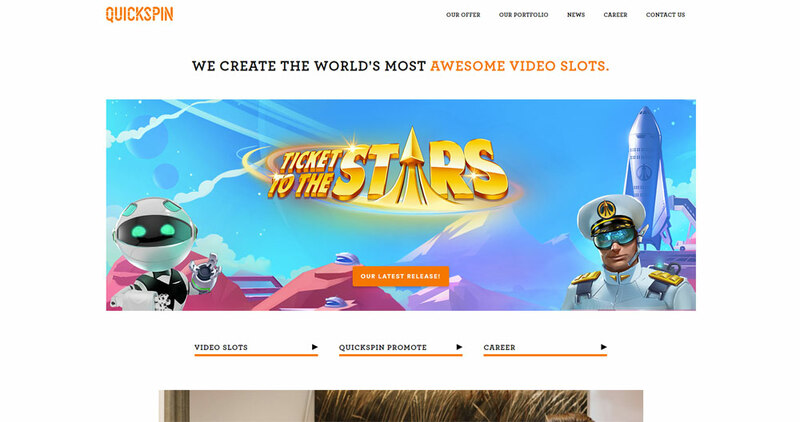 The company are constantly working on creating new video slots to appeal to the masses and have recently announced the new slot game Ticket To The Stars, a space adventure slot that is unlike no other out there!